internal contact provides a generous magnet gap of 1/2” (13 mm) and flexibility during difficult installations as it easily accommodates larger door or window frames. the tilt switch will activate and generate a transmission. To add an extra entry delay, the device can be programmed to wait one minute after the tilt switch activates before it transmits the alarm. 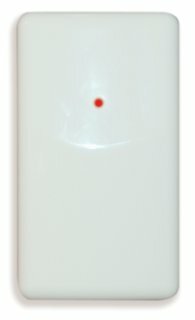 A red LED indicator on the WS4965 flashes at 10-second intervals to provide visual identification when a low battery condition is detected. This information is then transmitted to the control panel.